As a souvenir of their marriage (at midnight between July 12 and July 13, 1858), Louis Martin designed a medallion as a gift for Zelie. At the moment they exchanged their vows, the priest blessed the medallion. Louis slipped the wedding ring on the finger of Zelie's right hand, and then placed the medallion in her left hand, saying "Receive the symbol of our wedding promises." Below are photographs of both sides of the original medallion, now located at the bishopric of the diocese of Sees, in which Zelie was born. In honor of the beatification, the medallion was displayed in Alencon on Saturday, October 18, in the afternoon, before the Pontifical Mass celebrated there on the vigil of the Beatification. Louis chose the Biblical figures of Sarah and Tobias for this souvenir. Below are the couple's baptismal names, "Louis" and "Zelie." "M. L. uni a G. Z." stands for "Louis Martin united to Zelie Guerin"
Note that the initials of the surnames appear first. This points to how marriage was considered a union of the two families. 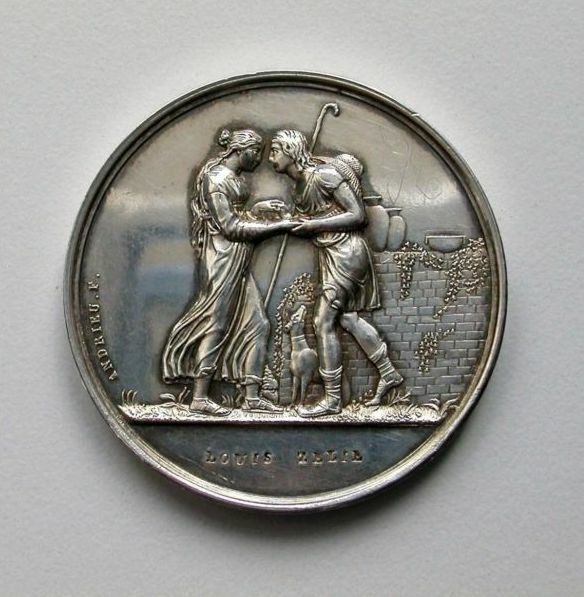 View commemorative medallions in honor of the beatification of Louis and Zelie Martin, based on the marriage medallion Louis designed. These medallions were for display; they were about the size of a small coaster and were most beautiful.